Club MAC Alcudia is all-inclusive. What does that mean? Well, all your food and drink is already paid for so you can relax within the resort and enjoy a little bit of everything! 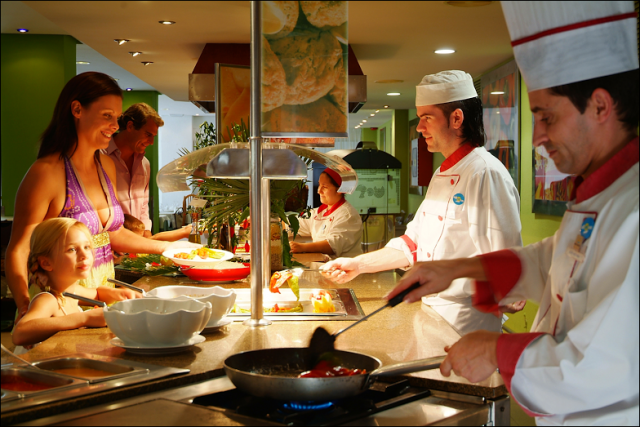 We have three restaurants to choose from, offering ‘all-you-can-eat’ style buffet breakfast and themed buffet dinners. From exciting choices at breakfast to soft drinks and beer on tap whenever you want it, there’s something for all the family. There are also plenty of veggie options and a kids’ corner catering just for the little ones. And for your baby, we have baby purees on offer, as well as access to microwaves and, of course, high chairs. In short, there’s everything you could need for fun, relaxed and enjoyable family meals during your holiday. If you’ve never been all-inclusive before and are wondering about the benefits, have a look at our 7 reasons to choose this holiday at Club MAC Alcudia. All-inclusive holidays are for families who want to relax, spend time with each other, enjoy the moment and not have to stress about anything. You don’t have to book restaurants, find food, wonder where you’ll eat tonight or worry about supplies. It’s all here for you, easily available and with so much choice you won’t get bored. If your idea of a great holiday is chilling by the pool, cocktail in hand, while the kids are entertained by qualified kids club staff, then Club MAC Alcudia is definitely for you. You won’t need to go far when you get peckish, as all our restaurants and bars are on site and included in your package. Perfect! When you book with Club MAC Alcudia you are getting access to our restaurants and bars, but also to all of the facilities and entertainment at the resort. We have kids’ clubs, included access to the waterpark across the road, sports, swimming and games. Once you’re on site and have your wristbands, then your whole family is secure in the knowledge that there’s not only plenty to eat and drink, there’s also plenty to see and do. With food, drinks, snacks, entertainment, many activities and more included in your package, you’ll find all-inclusive is a great way to get the best value for money holiday. This is particularly the case for families who want to enjoy a full, exciting and entertaining holiday together. You can sit back and relax, knowing that everything has been paid for up front and there’s nothing else to do but have fun. The children can enjoy endless ice cream, the parents can sip drinks by the pool and everyone can enjoy the food. With beautiful weather pretty much guaranteed during the season at Club MAC Alcudia, we offer the traditional family holiday of sun, sea, sand and so much more. We welcome many returning families every year, as they want to repeat the family-orientated experience enjoyed the previous year. While some excursions may cost extra, these are outside the scope of the all-inclusive. Your package itself has no hidden extras and by paying it all up front, you won’t need to worry about a big bill at the end of your stay with us. No surprises and no stress. That’s what we call a holiday! As everything is included, you are free to make full use of the Club MAC Alcudia site, including our swimming pools, sporting facilities, entertainment and the local, surrounding environment. This is particularly good for children, as they can try out new things without incurring extra costs and potentially wasting money. It is undeniably luxurious to have access to on site facilities, food and drink, entertainment, sun, swimming pools and everything else that comes with an all-inclusive holiday at Club MAC Alcudia. Once you’ve experienced the relaxing fun of an all-inclusive holiday with us, you won’t want to go back! We look forward to welcoming you to Club MAC Alcudia this summer. You can book online here. Don’t forget that it’s fully refundable up to 48 hours before your arrival date, just in case plans change.